Premature babies <30 weeks’ gestation with surgical necrotizing enterocolitis (SNEC) and presenting late with bowel perforation, septicaemia, bone marrow depression, and multiorgan failure, carry 30–50% mortality even following ‘last-ditch surgery’ guided by Bell’s criteria, that were designed for staging the disease and not for timing of surgery. Surgeons have sacrificed well-proven criteria for management of the ‘acute abdomen’, driving neonatologists to inappropriately prolonged complex conservative care and delaying surgery until ‘all else has failed’. Lucky survivors frequently suffer from functionally damaged bowel or the short bowel state requiring long-term parenteral nutrition, complex bowel reconstruction, and possibly transplant with life-long immunosuppression. Prevention of SNEC commences with parenteral nutrition supplemented with small volumes of residue-free enteral feeds rendered immunologically active by the addition of Whey from chymotrypsin-treated freshly expressed breast milk. Frequent joint assessment by a specialist neonatal team (neonatologist, surgeon, anaesthetist), proven management of the ‘acute abdomen’ supported by Doppler ultrasound for bowel loop perfusion, and early surgery for a child in good condition (Bell Stage Ia–c) should lead to better survival and live bowel. Aggressive-but-conservative surgery drains the peritoneal space and collapses and cleans distended bowel rapidly returning perfusion and avoiding bowel loss. 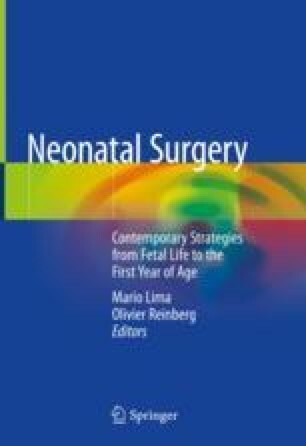 Modern neonatal anaesthesia and surgery ensure that premature infants in good condition, presenting with SNEC, do not die from early surgery (Bell Stage I), but rather from a failure to offer adequate surgery until late in the disease. Early surgery and live bowel are the keys to lower mortality, fewer children with short or damaged bowel, and quality of life.